(See here) Cut the vegetables lengthwise. 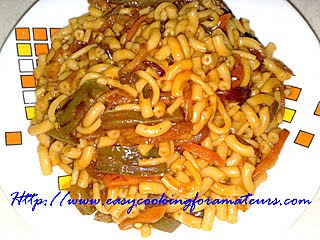 Cook macaroni in water with salt (1tsp). Cook macaroni till it fully cooked, expands & looks white. Note: If water becomes less while cooking. Boil water separately & add to it. Meanwhile heat the oil in a pan. 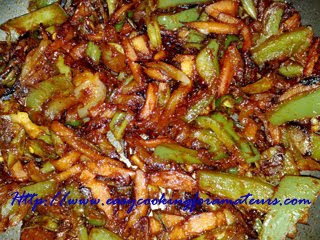 Add onion & fry till light brown. Add carrot, beans & salt (1/2 tsp) stir fry. Add ginger-garlic paste, green chillies & capsicum fry. Add chilly powder, coriander powder stir & add all the sauces & vinegar. Stir well & add salt to taste. Now the sauce is ready. When macaroni expands full & water level comes down to macaroni level. Pour macaroni with water to the sauce prepared & close the lid. Stir in between till excess water evaporates & the macaroni absorbs the sauce.